Xiao Shafu was born into an intellectual family in Chengdu, Sichuan Province in 1924. His father, Xiao Shen, was one of the representative scholars of modern Shu studies. His mother, Yang Lizhao, was an expert on poetry, painting and calligraphy. Xiao read a wide range of ancient and modern Chinese and Western books. In 1943, he enrolled in the philosophy department of Wuhan University, which had moved to Leshan, Sichuan Province, during wartime. There were only a dozen students and less than ten professors in the department. The students were deeply touched by their mentors’ uncompromising and rigorous spirit. During his time at the university, Xiao read many renowned books, such as Guo Moruo’s Ten Critiques and Hou Wailu’s History of Modern Chinese Thought. In 1947, he finished his bachelor thesis titled Immanuel Kant’s Metaphysics of Morals under the supervision of philosopher Wan Zhuoheng. Xiao became a teacher at Chengdu Huayang Middle School. At the same time, he was hired to teach history of European philosophy at a college dedicated to Chinese classics. He also edited a supplement of Western China Daily. In 1956, Li Da, philosopher and president of Wuhan University, invited him to reconstruct the Department of Philosophy. One year later, he started to serve as the director of the Teaching Research Office for History of Chinese Philosophy. For the next 40 years, Xiao worked diligently at this position. Xiao published a series of important academic papers after October 1976. In 1978, he was entrusted by the Ministry of Education to organize nine universities to jointly edit a textbook concerning history of Chinese philosophy for undergraduate students. 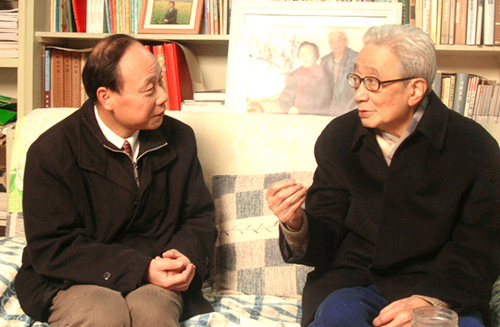 Xiao and Professor Li Jinquan were the editors-in-chief. The textbook constructed Chinese philosophy with the methodology of unifying logic and history, thus revealing the laws of Chinese philosophy’s development. It won the State Education Commission’s first prize for excellent teaching materials and educated two generations of scholars. History of Chinese Philosophy has had more than 10,000 copies printed and has been translated into the Korean and English languages. In the 1980s, Xiao published articles such as “The Twisted Path of Chinese Philosophical Enlightenment” and “Historical Reflection on Opening to the Outside World” in the journal Social Sciences in China. Through the study of early enlightenment thought in the Ming and Qing dynasties and the philosophical ideas of Wang Fuzhi, he dove into Chinese modernization, concluding that China has its own internal roots of modernization. In a new round of cultural discussion across China, Xiao proposed an independent argument that the enlightenment of Chinese philosophy initiated in the Ming and Qing dynasties. Such a stance was of wide interest to scholars at home and abroad. Xiao had drawn five principles based on years of teaching experience. He required students to develop expertise and morals, give equal emphasis to learning and thinking, and integrate history with theories. He also advocated comparing China with the West in terms of philosophy and having a thorough understanding of history and current situations. These have become the guiding principles of the Luojia School of Chinese Philosophy. The scholar’s charming personality garnered much affection from his students. Xiao’s studies touched upon wide-ranging topics while paying close attention to independent thinking and argumentation. He made remarkable contributions to pushing the disciplinary development of Chinese philosophy and reconstructing the history of Chinese philosophy from the pre-Qin period to modern times. In order to draw lessons from history, Xiao adopted a problem-oriented methodology concerning history of philosophy, attempting to break the shackles of dogmatism and introduce a spiral structure instead of a substructure. He also emphasized the consistency of logic and history and the dialectical connections among universal, special and individual circumstances. In this way, the scholar reviewed the history of Chinese philosophical categories and tracked its logical development. Being devoted to continuous improvement, Xiao put forward the unity of specialization and generalization in the study of the history of Chinese philosophy as an attempt to change the situation that started taking shape in 1919. Since the May Fourth Movement, Chinese philosophy was considered one that relied on, transplanted and imitated its Western counterparts. In many other cases, scholars drew a forced analogy by comparing historical documents of Chinese philosophy to certain methodologies or theories proposed by certain schools of Western philosophy. Xiao put forward theories in a macro scope while examining history from a micro perspective. He also investigated holistic history and individual cases at the same time, reviewing two historical transitions (the period of transition between the Zhou and Qin dynasties and that between the Ming and Qing dynasties) in terms of social and cultural transformation. He proposed and demonstrated that early enlightenment thought in the period connecting the Ming and Qing dynasties formed the fountainhead of Chinese modernization. Xiao’s academic efforts attracted the eyes of international academia and produced immense influence. When it came to his attitude toward history and culture, Xiao recognized their abundance, complexity, diversity, continuity and contingency and internal tension. He also believed in the possibility of cross-cultural communication and comparison. Xiao was a rare poet and philosopher in the history of contemporary Chinese philosophy. In his later years, he repeatedly emphasized the poetic nature of Chinese philosophy and explored the unity of Logic and Lyric. Such unity, in Xiao’s opinion, kept Chinese philosophy from the ecstasy of religion and the narrowness of scientific evidence, displaying a high degree of coexisting rationality and sensibility. Though mainly engaged in the study of history of Chinese philosophy, Xiao strived to discover the roots of modernity within Chinese cultural thought and honor the philosophers and thinkers who were overlooked by official documents and orthodox culture in history. He interpreted and spread the ideas of people who had provided new factors, new ideas and new values throughout history. Xiao emphasized the diversity of traditional Chinese culture and strived to expose the rich modern values of Confucianism, Buddhism, Taoism and other philosophical schools, especially the universal values contained in local culture. Xiao often absorbed new materials and ideas when teaching bibliography and methodologies for philosophical history, such as cultural reflection, the relationship between traditional culture and modernization, Jin Kemu’s comparative cultural studies on China, India and the West, and Zhu Guangqian’s translation of Vico’s New Science and its methodologies. He also tracked the latest research results of such international sinologists as William Theodore de Bar, Chen Rongjie, Mizoguchi Kozo and Fu Weixun. This new information and his reflections later became the content of his teaching. Xiao, a pioneer of the discipline, had an open and broad vision, brilliant organizational skills and a keen nose for the latest movements in academic circles around the world. Teachers and students in his department were encouraged to expand and optimize their knowledge structure by involving themselves in global scholarly exchanges. He often consulted Chinese and foreign experts with humbleness. In addition, Xiao explored the comparative research of Chinese thought and Japanese thought, and he supported the studies of Chu bamboo slips dating back to the Warring States Period. He has guided many students following in his footsteps to exert their efforts in history of culture or history of Chinese philosophy. He also encouraged his students to pursue research interests in the fields of scientific philosophy, politics, sociology, management and communication. Xiao said that Chinese modernization was by no means only a form of Westernization. It was a chosen combination and reconstruction of diverse traditions and exotic cultures in order to keep pace with the era. Therefore, a country should identify its internal historical basis and the factors which could be modernized for developing its own traditions and cultures. In other words, it should locate a cultural junction connecting traditions and modernization. Xiao hoped to overthrow the persistent pattern of thinking where there was an opposition between China and the West and a division between noumena and functions. Xiao was a scholar of vast learning. He talked about the age of enlightenment just as the flaws of modernity were being exposed between the 1980s and the opening chapter of the 21st century. In this context, a Chinese poet and philosopher’s argument about enlightenment went beyond the scope of the modern Western concept of enlightenment. Instead, it contained many elements of reflection, aiming to reconstruct the subjective consciousness of the Chinese culture. To fail to recognize this is to underestimate the significance of Xiao Shafu’s academic thought. This article was edited and translated from Guangming Daily.